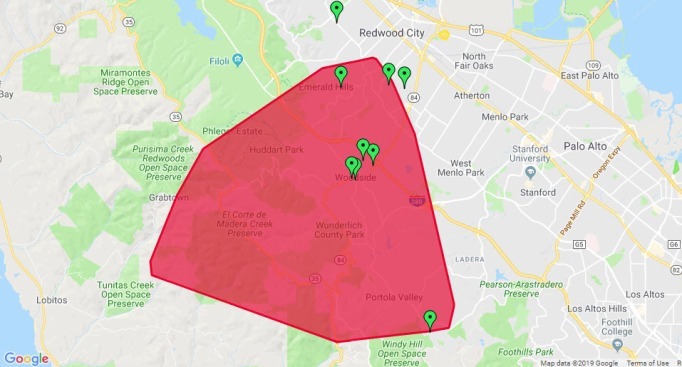 PG&E outage map shows thousands of Redwood City residents without power on Saturday, March 9, 2019. Power has mostly been restored for thousands of Redwood City residents Saturday afternoon. Around 7,000 PG&E customers in the area of Farm Hill Boulevard and Silver Hill started experience power outage around 11 a.m., according to PG&E and Redwood City Police. PG&E said it was investigating the cause of the outage and restored the power just before 2 p.m.